Bangkok, Thailand -- There were piles of dharma books. The words on the pages sounded nice, thoughtful, soothing. But Manasikul Ovatpesuch felt it was not enough. She needed some other answer to life's foibles. Her boss agreed to let her take a sabbatical leave without pay for four months in order to enrol in a special retreat programme run solely by and for women at Suan Mokkh forest monastery in the South. Manasikul's life hasn't been the same since. "People take leave for educational purposes. So this could be described as spiritual education," explained Manasikul, a journalist. "For me, such an inward form of learning is far more important than worldly classes. Anyone who has learned the noble art of living will become happy with themselves, and as a result, be more efficient and creative at work," said Manasikul, who now writes a dharma column called "Pakklod Klang Pa Kradad" (Hermitage in the Forest of Papers). What's so special about the course Manasikul took? The Dharma Mata Hermitage, a 40-rai compound attached to Suan Mokkh, is a sanctuary created specially for women, whom the late Buddhadasa Bhikkhu addressed as phet mae (the "mother gender"). When he was alive, Buddhadasa often mentioned how he felt grateful to his mother, the main supporter of the forest monastery in its early days. "Whatever I need, Mother will always be willing to give me her help. All that I've done has become possible because of her. Society should treat phet mae with as much respect as they can," said the monk. "To me, Buddhadasa was a genuine forerunner of women's rights activists," said Dr Sermsap Damrongrat, a retired physician and also a core member of the Dharma Mata Hermitage. "The monk wanted to see women have as equal an opportunity as men to learn and practise dharma. He also said it was better for women to teach and train among themselves, for it would be more convenient and appropriate [compared to having monks perform the mentor's roles]." Thus the first vision of the women's sanctuary came about. Unfortunately, due to his ailing health, Buddhadasa Bhikkhu was unable to fulfil his wish. He passed away in 1993 at the age of 87. In 1999, Metta Panich, one of Buddhadasa's nephews, learned about his uncle's idea of the Dharma Mata Hermitage. The young man decided to revive the project and recruited help and guidance from Ranjuan Indrakamhaeng, a senior student of the late monk. The well-respected ubasika (female lay practitioner) has subsequently played a pivotal role in setting down the first regulations as well as details of both theoretical and practical courses. For the past six years, the Dharma Mata Hermitage has provided an invaluable space for women to undertake full-time spiritual pursuits - long a sole prerogative of men only. Participants can choose either to attend an intensive four-month programme (the latest of which starts today, September 1) or shorter 10-day courses organised throughout the year (see box below). 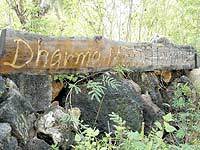 The Dharmadana Foundation, another offshoot of Suan Mokkh, takes care of the administration and funding of this women-oriented sanctuary. Unlike their nun counterparts, those who seek "refuge" at the Dharma Mata Hermitage are not required to have their head shaved nor to wear white robes. Neither are the women students, called "Dharma mata" (mother of Dharma), compelled to do general chores like cleaning and cooking for the monks in exchange for the abode. Their daily routine is similar to those in the ecclesiastical realm. Like Manasikul, all the residents at the sanctuary must adopt the eight precepts as well as the guidelines prescribed in the Gotami Sutra (named after the first female monk or Bhikkhuni). They must vow to practise dharma with resolution and self-discipline. Perseverance, humility andvirtuous loving speech are some of the desirable traits. Each week, every participant will take part in the "bok ubosoth" (confession ceremony). And besides the regular Vipassana (insight) meditation sessions, everyDharma Mata student must take classes in Buddhist philosophy. Manasikul said subscribing to a spartan way of life at the hermitage helped her to cultivate insight into leading a happy, peaceful life. During the four-month retreat, she stayed in a small kuti with very basic facilities: a wooden platform to sleep on, a blanket, a small table, a chair and a stainless steel cabinet where she kept three sets of clothes - the only garments she had for the whole course. "The less you have, the lighter and happier you feel," she said. Simple fruit- and vegetable-based meals are served twice a day, and only once on the "religious" days (based on the lunar calendar). Eating with mindfulness usually takes at least half an hour. "It's interesting that my health has improved a lot after I adopted this eating habit," she said, adding that her ageing mother recovered from knee pain while staying there despite the fact that she had to do sitting meditation in a cross-legged position. At night, Manasikul slept in the saiyas position (lying on her right side) with her head on a wooden pillow. And on full moon nights, she was encouraged to stay awake - called the practice of nesajchik - as a way to cultivate perseverance. On such nights, she would do sitting, standing and walking meditation until the break of dawn. The tranquil, rustic environment at Suan Mokkh was a great boon to help silence her mind, Manasikul said. "The experience was really good. I had a chance to review my life. My life flashed back before my eyes relentlessly - it was like watching a film with myself as the main character. And I realised that I had many people to apologise to," she said. "It's good to remove some of the things that have been festering in the mind for so long. At last, I tasted moments of inner peace." Essentially, the ultimate goal of the Dharma Mata Hermitage project is to assist women who want to dedicate their lives to the practice of dharma - and to become "spiritual ambassadors" for propagating Lord Buddha's teachings to the world. However, due to limited personnel and resources, there has been so far no one who can really commit themselves to the vision. Besides the members of the founding committee, all of whom are advanced in years, there is only one other member who has been living at the sanctuary for two consecutive years. "It's easier for men to go on spiritual pursuits. It's accepted as tradition and duty. However, women are perceived to be domestic, taking care of household chores and tending to parents. So it's more difficult to take this route," said Dr Sermsap. On the other hand, many of today's rampant social ills might be attributed to the poor plight of women - the sanctuary is thus an important venue for women - whom Buddhadasa regarded as "bearers of children's spirits ... and thus creators of the world" - to empower themselves. For one thing, the meaning of the Dharma Mata Hermitage is "to have dharma as mother, and to foster dharma in the mother-gender." "It's important to give women an opportunity for spiritual advancement andeducation. They should learn about the virtuous duties of being a mother and follow their duties," said Sermsap, referring to the monk's vision. "The `mother gender' will help bring back morality to the world. If our mothers are good, they'll pass on their good spirits to their children." For Manasikul, the four-month retreat gave her precious experiences that she still cherishes, two years on. "I feel like I've been given a new life. I'm now less prone to anger and anxiety. When negative feelings arise, I can let go of them more easily and faster than before. Happiness is, in fact, easy to come by. It is always around if we take care to look for it. "When I get up, I usually spend some time in the backyard garden sharing my happiness with birds, squirrels and trees. While working in the office, I become clearer on what I want to do and I can concentrate on doing it instead of expecting any return." The youthful-looking woman paused. "Had we learned about this art of living when we were still young, there would be no need to waste years and years suffering unnecessarily." Next year, as part of celebrations to mark the centenary of the birth of Buddhadasa Bhikkhu, the Dharma Mata Hermitage will be offering a series of retreats for women, beginning on January 7; some two weeks in duration, others lasting four weeks. These residential courses will focus on issues such as: What is life? ; Why are we born? ; What is dharma? ; What is suffering? ; What is the cause of suffering? ; How can we get rid of it completely? ; What did Buddhadasa Bhikkhu mean when he said "to work is to practise dhamma"? ; Can we work and be happy at the same time? Most of the retreats will be open to women between the ages of 25 and 65 but some will cater specifically to teenage girls. In order that the learning process will be a peaceful and beneficial one for all, participants must agree to maintain silence for the duration of the retreat and to abide by all the other regulations in force at Dharma Mata Hermitage. There is no fee but donations to the Dhammadana Foundation are welcome. To apply for a place on one of the courses or to obtain more information, email dhammadana@hotmail.com or phone 07-743-1596 or 07-743-1661/2.